Have dessert ready in minutes with my super quick & easy Snickerdoodle Mug Cake. 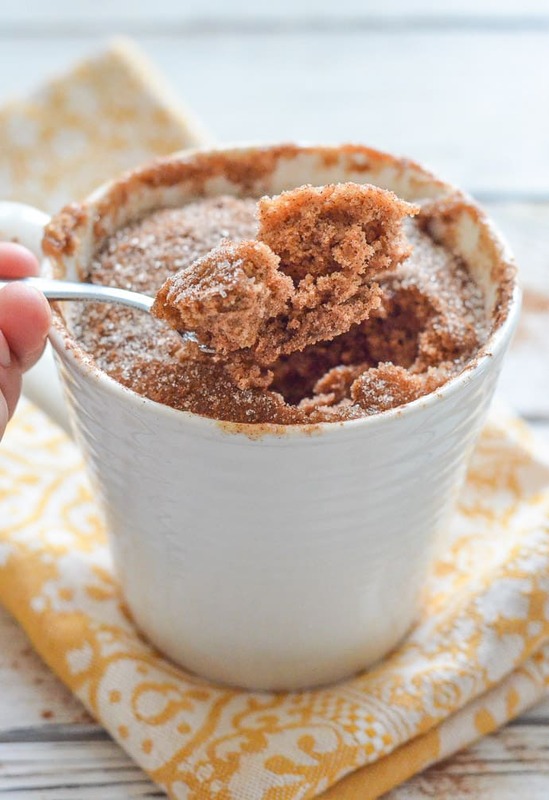 It’s soft, fluffy & cinnamon-y & perfect for when you want something sweet without making a full-blown dessert! You know those times when you suddenly get the urge for dessert, and it’s late and you have nothing ‘nice’ in the house at all? ???? We’ve all been there and it’s super frustrating. “Hangry” doesn’t even touch it. 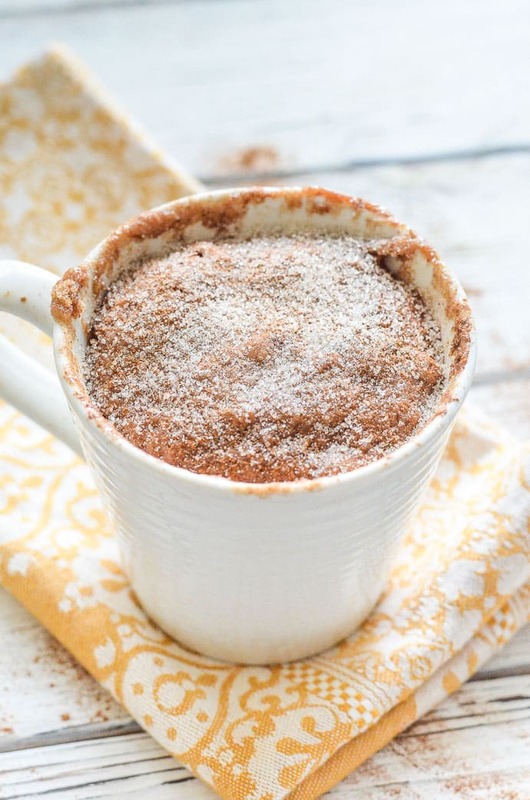 Feed me Snickerdoodle Mug Cake and I’ll shut up. Until now, when we have wanted a quick sweet, cinnamon hit, there has been my Cinnamon Roll in a Mug. Boy that recipe is unbe-liev-ably popular. Like ridiculously so. I think about 60% of my website’s traffic comes from that recipe alone. But, even though it’s quick, it still takes a little effort as you have to mix the dough, roll it out, sprinkle it, roll it up etc before microwaving it. 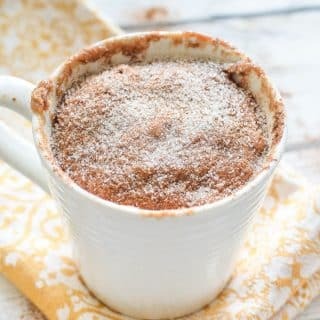 This Snickerdoodle Mug Cake gets mixed up right there in the mug you are going to cook it in and eat it from. It takes longer to get the ingredients out of the cupboard than it does to mix it up and cook it. It’s like super-hero dessert and it’s my current favourite vegan mug cake obsession. Now I know I’ve gone a little “Snickerdoodle crazy lady” of late. Actual Vegan Snickerdoodles, followed by Snickerdoodle Dessert Hummus, followed by this here Snickerdoodle Mug Cake. All in pretty close succession. Please remember though, that I didn’t even know that Snickerdoodles existed until pretty recently, and having gone the first 40 (something) years of my life without them, I am going to make pretty darn sure I make up for lost time. So tell me, what can I snickerdoodle next? ???? In a roughly 12oz/350ml size mug, add the nut butter, aquafaba, maple syrup, vanilla extract and milk. Stir until completely smooth. You might need to squish the nut butter about a bit with the back of the spoon to break it down. Add the sugar, cinnamon, flour, baking soda and salt and stir until combined. Don't over mix it. Just keep going until you can't see any dry flour anymore. Be sure to reach right down into the bottom of the mug as you stir. Put in the microwave leaving it uncovered. The first time you cook it there will be a little trial and error because all microwaves are different. In my 1200 watt microwave it takes 1 minute 5 seconds for the cake made with all purpose flour and 50 seconds for the one made with oat flour. You will need to adjust slightly to suit. I suggest going for 1 minute to start with the all purpose flour cake then checking and adding on a few more seconds if necessary. Once done it will have puffed up to fill the mug. The top will look slightly damp but if you give it a poke with a fork you will see fluffy sponge underneath. Sprinkle the cooked cake with a generous sprinkle of sugar and some more cinnamon if you wish. Eat immediately. Very good. This turned out great. Next time i’ll probably whip up a small amount of vanilla cinnamon icing to throw on there too. But that’s just me and it was really good without any icing. Do you have instructions on baking this in a conventional oven? I don’t have a microwave. I have never tried it in an oven. You would need to use an oven proof container. I reckon about 350 for 10-15 minutes. Jut until a toothpick comes out clean or you can poke the top and it’s soft but bounces back. Good luck! Can you sub water for the aquafaba? Just out of curiosity, why do you use it? Water wont work in it’s place.Sorry! Aquafaba is used as an egg replacement. Out of all the vegan egg replacements there are, aquafaba gives by far the best results in cakes and muffins. It helps make the sponge nice and soft and fluffy. It has similar starch and protein content to egg white which is why it works so well. You could use a flax or chia egg instead but it won’t turn out quite so well. Hope that helps!